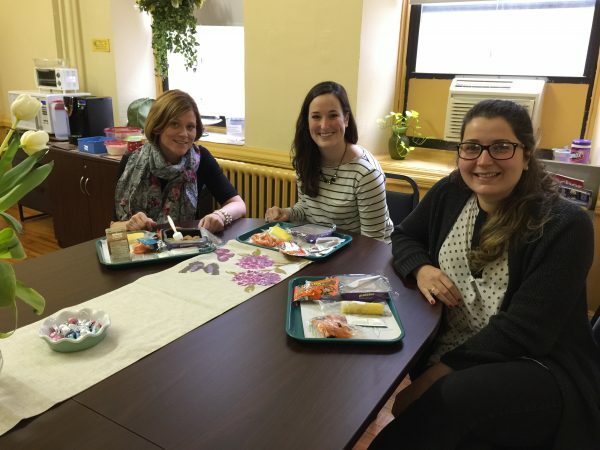 On Thursday, March 30, 2017, NDS held a Staff Appreciation Lunch to show gratitude and appreciation for all those who help make the school meals program a success. This year, staff members from partnering schools were invited to get in line with students and enjoy a popular, nutritious, and delicious meal: popcorn chicken served with fresh romaine salad, baby carrots, fresh pineapple, Keebler Elf grahams, and a carton of milk. In addition to a fun day for staff members, students enjoyed seeing their role models making healthy food choices. When teachers from St. Frances Cabrini Regional Catholic School in Philadelphia got in line with their students, the kindergarten class roared with laughter. Since 2014, NDS’ annual Staff Appreciation Lunch has served over 2,300 lunches to thank staff at our partner schools. NDS looks forward to continuing this tradition each year.